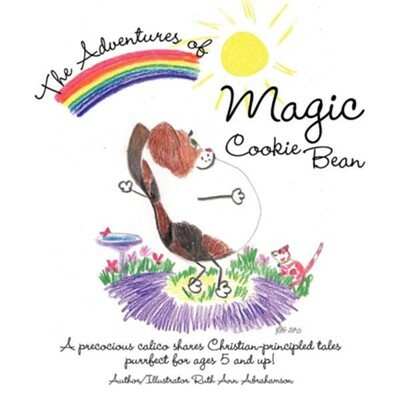 The Adventures of Magic Cookie Bean: A Precocious Calico Shares Christian-Principled Tales; Purrfect for Ages 5 and Up! When Magic was but a little sprout, she too fell from the Bean stalk. She came into this world as a precocious Calico Kitty Bean . Being that she was curious, she wandered away from her parents and became lost. A huge flood came and Magic was separated from her family. She was swept away and when she awoke, Magic lay weary on the shore of a sandy beach. Fortunately, two passersby found her and took her to a local animal shelter. There she was cleaned up, dried off and fed a wholesome meal of cat chow, warm milk and cookies. Magic was adopted by a wonderful family who had three other kitties. She was brought "home" where she discovered her favorite place to play, dream and feel secure was in their rock garden. It became Magic's Rock Garden. There in the rock garden Magic was surrounded by colorful flowers and even a bird bath where she and her friends could drink fresh water. Magic loves her Rock Garden and Magic loves her guardians who show her everyday how much they feel blessed to have adopted her She is still very precocious and likes to get her own way Yet her magnetic personality continuously draws friends to the Rock Garden and this cherished place - right in her back yard - becomes her mission's field to teach wholesome Christian values. Her adventures take her to faraway places, yet she always returns to the Garden built on a Rock of love and security. I'm the author/artist and I want to review The Adventures of Magic Cookie Bean: A Precocious Calico Shares Christian-Principled Tales; Purrfect for Ages 5 and Up!.